Using a set of fluid equations to describe the inertial dust grain component in a dense collision-less unmagnetised plasma under the influence of weakly relativistic semiclassical electrons and positrons, the propagation of dust-acoustic wave is studied in the strong coupling regime when the dust density is non-uniform. Our main aim is to analyse the role of semiclassical and relativistic environment (frequently encountered in astrophysical context) on various features of strongly coupled dusty plasma. 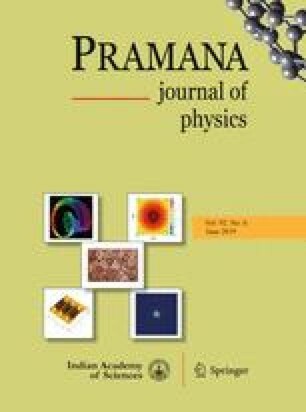 The semiclassical environment of the electrons and positrons is assumed to be described by the Chandrasekhar equation of state. Our second aim is to see the effect of spatial variation of the dust equilibrium density, which is known to occur due to the deformation of the Debye sheath which in turn leads to polarisation force. A new type of nonlinear Schrödinger equation with spatially varying coefficient is deduced and its modulational stability is studied in detail. In the last section, we have taken recourse to Madelung picture to deduce a variable coefficient Korteweg–de Vries equation from this new nonlinear Schrödinger equation.